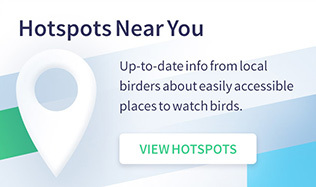 An urban haven for kestrels, sparrows, and other open-country birds. Managed grasslands flourish in the spaces between the unused runways at Floyd Bennett Field, creating a haven for kestrels, sparrows, and other open-country birds. Visitors are welcome to explore the old concrete paths on foot or by car; I prefer to bird the airfield by bicycle. First, I usually lock up my bike and walk through the North Forty Natural Area. Kinglets, Yellow-rumped Warbler, Hermit Thrush, and other songbirds congregate in the shrublands, and, when it’s not frozen over, a small pond in the North Forty is productive for dabbling ducks and wading birds. Next, I head over to the cricket field, where Horned Lark and the occasional Lapland Longspur spend the winter. A community garden is excellent for rare sparrows, and at the main field, I scan for raptors and migrating grassland specialists like Bobolink. Finally, I check the bay for diving ducks, loons, grebes, geese, and cormorants. Jesse Greenspan is a freelance journalist who specializes in environmental and energy issues. He has written for Audubon, Newsday, and the New York Times. 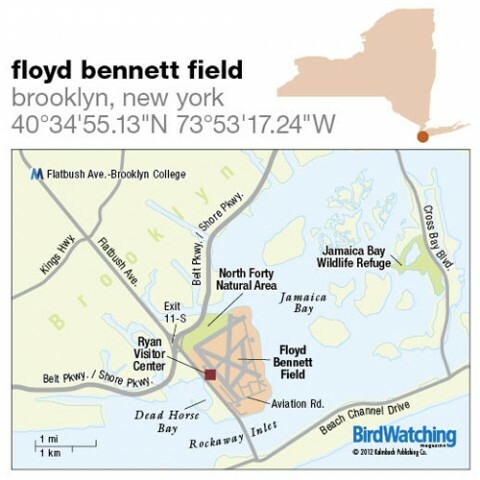 Floyd Bennett Field is a decommissioned airport that today features grasslands, a wetland, and other bird habitats. From the Belt Pkwy./Shore Pkwy., take exit 11-S onto Flatbush Ave. and go south. Drive 1.2 miles and turn left onto Aviation Rd., the entrance road to Floyd Bennett Field. Park in any of the parking areas that line the runways. Flat. All areas accessible by car except the North Forty Natural Area. Walkers should be prepared to log a few miles. Summer: Gray Catbird, Black-crowned Night-Heron, Savannah Sparrow, Tree Swallow, Common Yellowthroat. Late fall and winter: American Kestrel, Red-tailed Hawk, Northern Harrier, Bufflehead, Red-breasted Merganser, Green-winged Teal, Northern Shoveler, Brant, Horned Grebe, Horned Lark, White-throated Sparrow, Yellow-rumped Warbler. 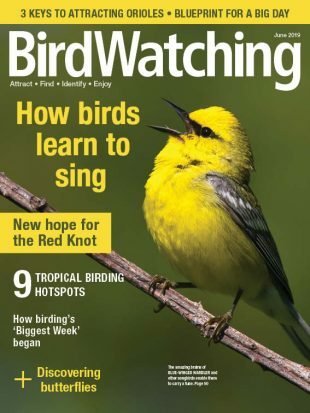 Migrants: Eastern Meadowlark, Bobolink, Ruby- and Golden-crowned Kinglets, Hermit Thrush. Uncommon: Lapland Longspur, Short-eared Owl, American Pipit, Red-necked Grebe, Clay-colored, Vesper, and Lark Sparrows. Walking trails, restrooms, food and drink concessions, visitor center, campsites, and two bird blinds on shore of pond. Occasional birding trips led by Brooklyn Bird Club, Linnaean Society of New York, and New York City Audubon. National recreation area. Open every day from dawn to dusk. No fees. Visiting at night requires a camping or fishing permit. To reach the airfield by mass transit, take the No. 2 subway train (or the No. 5 train during certain hours on weekdays) to the last stop, Flatbush Ave.-Brooklyn College, then transfer to the Q35 bus going south. Dress warm and be prepared for high winds. Watch out for ticks in season. A spotting scope is helpful for scanning the bay and grasslands but is not essential. Directly across Flatbush Ave. from the Ryan Visitor Center. In winter, a massive flock of Greater Scaup. Lesser Scaup and other duck species possible. South of Belt Pkwy. on Cross Bay Blvd. At least 325 species. Wading birds, shorebirds, songbirds, raptors, and waterfowl abundant. Jesse Greenspan is a Berkeley-based freelance journalist who writes about history and the environment. His work has appeared in The New York Times, Scientific American, Audubon, the History Channel, and other outlets.